Stay in control when importing goods from China. Don’t get burnt by a China sourcing agent. Make sure that you import from China direct from the manufacturer. Your Business has invested time and money into designing and identifying products for your market and you are ready to find a supplier and start importing goods from China. You already know that when you import from China, finding the right supplier before you place your order is essential. However, you don't have the time or resources to fully research and investigate suppliers. And you don't want to spend time and resources constantly traveling to and from China. So, you find a China sourcing agent. Or, unbeknownst to you, a China sourcing agent who is pretending to be a manufacturer. Please Note: Buy From China would like to make it clear that the use of the colloquial term "middlemen" or "middleman" throughout this website is non-gender specific, we hate all genders of middlemen equally. To import products from China you don't need a China sourcing agent and you definitely don't need the headaches that they create. Our tried and tested process puts you in control. We make sure that you have all of the information and resources required in order to efficiently import from China. It's not always obvious that you are dealing with a middleman until something goes wrong. 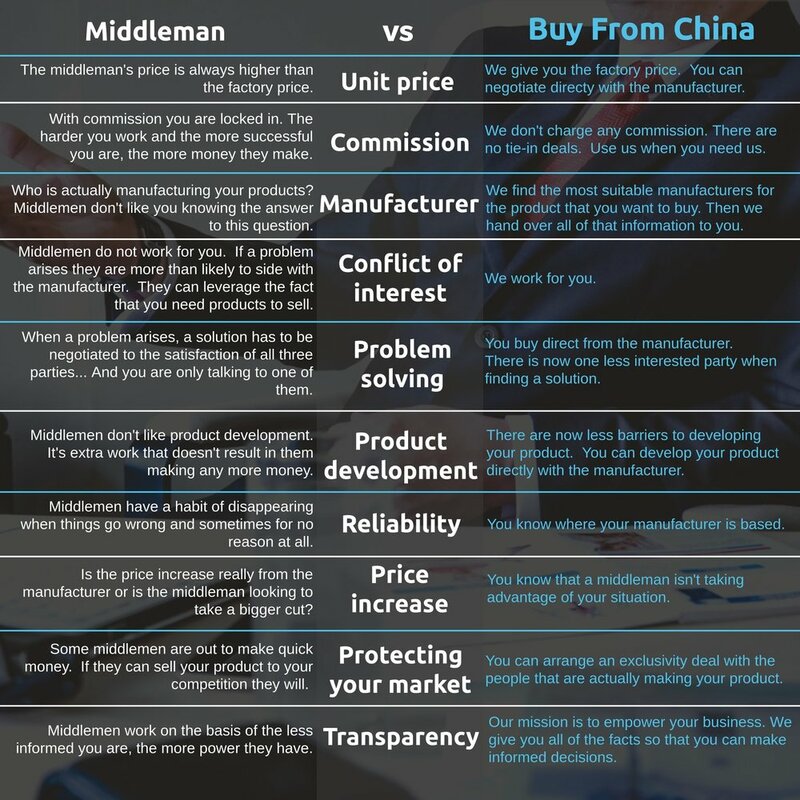 Below are some common problems that companies face when they use sourcing agents and other middlemen to carry out their product sourcing in China. Our services are designed to be flexible. 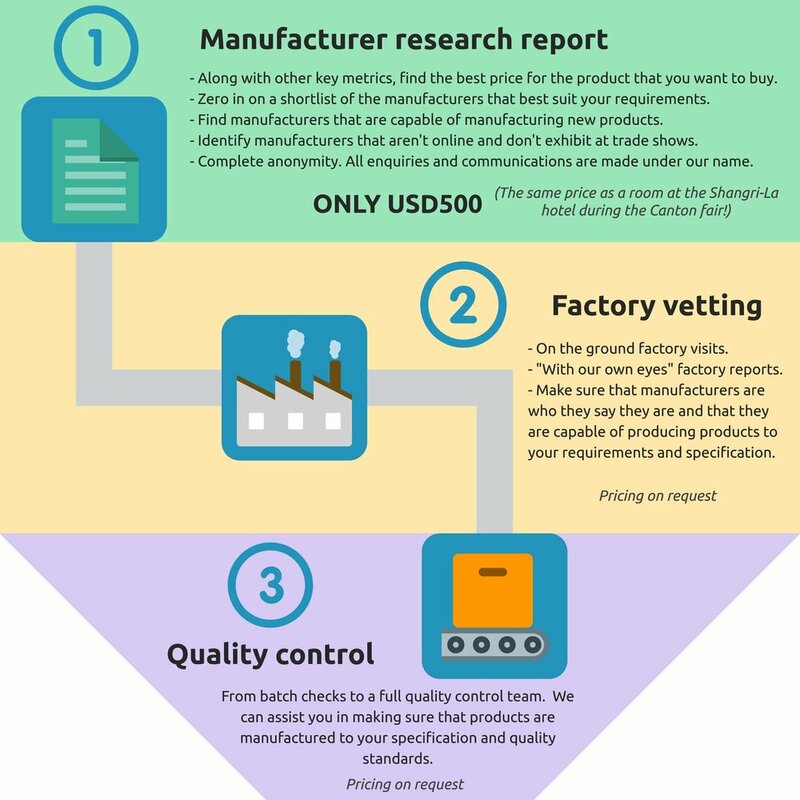 Whether you are looking for assistance with a single part of your supply process or you need a full turnkey solution, with Buy From China you can take control of your product sourcing and offer your customers the best products possible. We do the researching, chasing, questioning, investigating and checking so that you can focus on selling, your market and your customers. Let us know a bit about you and we'll be in touch for a free consultation. Thanks! We'll be in touch shortly to discuss your enquiry. 17 years of international trade with Chinese companies ...and getting it right! - Setting up and managing our own factories in China. - Factory production and order management. - Sourcing products and vetting manufacturers. - Assessing and testing product samples. - Importing goods from China to international markets. - Price negotiation with suppliers. - Shipping, logistics and customs procedures. - Experience of actually selling the products that we have imported into international markets. - Carrying out quality control inspections and managing quality control inspection teams. - We understand Chinese business cultures and customs. We started this company to provide a flexible product sourcing service that we would have killed for a few years back. Back then, we were either traveling backwards and forwards to China with the latest problem running through our heads, or feeling powerless and uninformed at the hands of a middleman using the physical distance to his advantage. Our aim is to provide a service that allows our customers to be able to source and import goods from China in a way that is cost effective, under their control and above all else, transparent and open. Can’t I just use alibaba or another sourcing site to find suppliers? From personal experience we know that many of the suppliers on Alibaba are pretending to be manufacturers when in fact they are import export companies looking to take a cut in the middle between your business and the actual manufacturer. We speak Chinese and communicate with suppliers in Chinese. Communicating with suppliers in English often leads to "misunderstandings" and difficulties in discussing specification, quality and other metrics such as the markets that they are currently selling into. 99% of the time, the supplier’s English speaking employee who’s job it is to communicate with foreign businesses has been hired because they can speak English, not because of their knowledge of the product that is being manufactured. To keep costs down, the people hired for these positions are often junior in the company and aren’t allowed to make important decisions with regards to sales and pricing. If there is a technical question that they aren’t sure about, it’s not uncommon for them just to guess and then later blame the resulting issues on a communication or translation problem. We can find and talk directly to the right person in the company. Why can’t I just hire a translator? People that advertise themselves as translators are often “stealth middlemen” and get a cut behind your back on every item that you order without you knowing about it. We want to find a manufacturer for a new product that we have designed by ourselves, is this something that you can do? Yes, we can anonymoulsy search for the best fit manufacturers for your project. We have a method for finding manufacturers that are capable of making the product to your requirements and quality standards whilst at the same time protecting your intellectual property rights. Can you help us with samples from manufacturers? Yes, one of the most important steps of importing from China is to get samples of the products that you want to buy. Got some other questions? Ask away! Thanks for getting in touch. We'll get right back to you.